Nineteen-eighty, the year preceding the hungerstrikes at Long Kesh Prison, was a time of “calm before the storm.” That year, violence in Northern Ireland was at a relative low, and government efforts to further the peace process were minimal: expectations for achieving peace were not high, and Republican parties in Northern Ireland, particularly the Social Democratic Labour Party (SDLP) were undergoing internal changes characterized by a shift to a more nationalistic mission. Neither republicans nor unionists expressed a willingness to compromise or further the peace talks. Unionist parties defended their position not through change or adaptation, but by fending off “all new initiatives and attempts at finding inter-party agreement” (McKittrick).1 Though politics remained essentially at an impasse, military tactics changed. Unionists began to focus on assassinating prominent republican and nationalist figures rather than committing random attacks on Catholic communities. 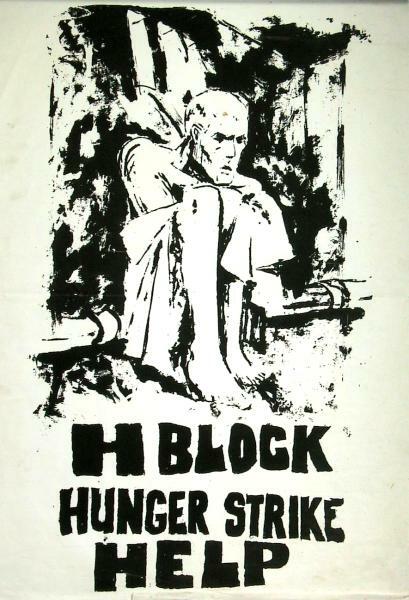 This political stagnation came to an end with the H-Block Hunger Strikes of 1981. Beginning in 1972, prisoners associated with “paramilitary groups,” such as the IRA, had been given “special category status” – political, as opposed to criminal status. Because Ireland was denied a military force that represented its interests, Republicans argued, the IRA functioned as a military, rather than terrorist group. As such, people imprisoned for IRA activities should be treated as prisoners of war, not common criminals. Prisoners’ rights included: wearing their own civilian clothing, opting out of prison work, having additional family visits and packages, and being directly governed by their own officer, rather than a prison guard. In 1975, the Loyalist government announced that special category status was to be phased out. Former political-status inmates would lose all of their special rights: they would be housed in H-shaped blocks, along with common criminals, they were forced to work in prison industries, and they were required to wear prison-issue uniforms. Republican prisoners revolted immediately. They took action by refusing to wear prisoner uniforms, and as a result, were left wearing only blankets. In punishment, they were confined to their cells, denied family visits and packages, and lost remission, which should have shortened their sentences. Eight hundred years of crime." The situation in the H-blocks intensified, as prisoners launched a no-wash protest. Until their rights were returned to them, prisoners refused to wash or allow their waste to be removed from the cells. After a leader in the Catholic Church visited the prisoners and spoke to the public about the terrible conditions within Long Kesh, public support for the H-block prisoners increased significantly. A propaganda war began between Republicans and Unionists, each vying for public sympathy through publicity. The strikes did not have an effect until they were viewed and understood by other people; once this happened, the strikes created sympathy for the cause. They also represent an example of Civil Disobedience in which unjust policies are protested through symbolic action and noncooperation. The strikers chose to not cooperate in policies they were opposed to – wearing prison uniforms – not through violence, but through civil disobedience. The point is to expose injustice, rather than commit acts of lawlessness. MacNair again emphasizes the importance of media attention: “Civil disobedience is most effective when the media covers the action for the wider community” (141).8 The media played a major role in drawing attention to the strikers’ cause and creating support for them and disgust for their opponent, Margaret Thatcher. Without this media coverage, it is unlikely that the strikes would have seen the support that they ultimately did. In 1980, seven prisoners launched the first hungerstrike. It was a tactic which had been used successfully in the past, and which they hoped would allow them to re-gain the rights they had been denied. This first strike ended after two months due to the strikers’ failing health, but a second hungerstrike was initiated on March 1st, 1981. It was phased such that a new prisoner would go on strike every two weeks, until their demands were met: 1) wear their own clothes; 2) no prison-mandated work; 3) free association; 4) weekly letters and visits; 5) restoration of remission. Bobby Sands, an IRA Officer Commanding (OC), was the first prisoner to go on hungerstrike. Contrary to popular opinion, the authors of Making Sense of the Troubles argue that the H-block prisoners were not coerced by the leadership of the IRA, but actually acting against official IRA wishes. The IRS discouraged the strikes for a variety of reasons, including fear that they would lead to divisions within the party, concerns about division of resources, a sense that the strikes deviated from the central mission or goal of the party at the time, and worries about the consequences of failure. "If Mr. Sands persisted in his wish to commit suicide, that was his choice." The leader of the strikes, Bobby Sands, quickly became the poster-boy for the cause. He was portrayed as young and friendly, and evoked an image of “victimhood and self-sacrifice.” In an unexpected turn of events, Sands was proposed as a candidate for British Parliamentary office. Against all odds, Sands was elected as MP, with 87% voter turnout. He was, however, to weak to take office, and on May 5th, after 66 days on hungerstrike, Sands fell into a coma and died. Thatcher’s cold, bitter and totally unfeeling response to the tragedy was internationally lambasted, and Sands’s death lead to a massive outpouring of public sympathy and support for the H-blockers and the Republican cause. Ten thousand people attended Sands’s funeral, and the event represented a major shift in public perception of the IRA. By August, 1981, ten H-block strikers were dead; the end to the strike came when family members intervened to save the lives of their comatose sons and husbands. Shortly after the end of the strike in October, the prisoners were re-granted the right to wear their own clothes. The strike was technically a defeat for the IRA, but the ensuing massive public outcry against Thatcher and the Unionists brought many gains for the Republicans. Evidence began to emerge that the Unionist “security forces,” which were meant to serve as police, had frequently killed or maimed, not active rioters, but innocent bystanders, including two young girls. The IRA won support and political status both in Ireland and internationally, and a wave of new recruits flocked to join the IRA and Sinn Fein. The strikes, and Sands’s election to Parliament, also represented an infiltration of the political system by Republicans, and set a precedent for “legitimate” political action by the groups.